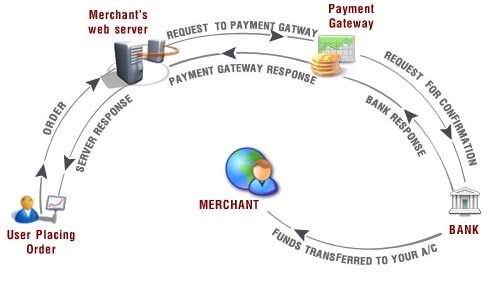 Payment Gateway refers to an e-commerce service that authorizes payments for e-businesses & online retailers. In a way, it represents a physical POS (Point-of-sale) terminal located at most retail outlets. Payment gateways encrypt sensitive information, such as credit card numbers, to ensure that information passes securely between the customer and the merchant. Integrating a payment gateway is one of the most important things a person who is into ecommerce should be implementing. This payment system will not only help boost the business, it will also aid the owner of the business to generate more workload while leaving some of the job to the payment gateway when it comes to financial matters. Visitor places the order on the website and it is sent to the merchant’s web server in encrypted format. This is usually done via SSL (Secure Socket Layer) encryption. The transactions details are then forwarded to the concerned Payment Gateway. The transaction information is then passed on to the merchants acquiring bank by the Payment Gateway. Merchants acquiring bank then forwards the transaction information to the issuing bank (one that issued the credit card to the customer). Then the card issuing bank sends a response back to the Payment Gateway. The response includes information that whether the payment has been approved or declined. In case of declination the reason is also sent in the response. The response is then forwarded by the Payment Gateway to the merchant’s server. At merchants server the response is encrypted again and is relayed back to the customer. This allows the customer to know that whether the order has been placed successfully or not. The entire process typically takes less than 5 seconds. At the end of the bank day (or settlement period), the acquiring bank (or card issuing bank) deposits the total of the approved funds in to the merchant’s nominated account. How we can help in your Payment Gateway Integration? Oricube Technology and Services Pvt. Ltd. has high reputations in providing their clients high quality marketing services such as payment gateway integration. This team is a group of professional people who have been programming, designing, and developing all kinds of online elements that will aid their clients with their marketing troubleshooting. Oricube Technology and Services Pvt. Ltd. and its service providers are committed to only give the best of what their knowledge can give that will help the marketers reach their marketing goals. The Payment Gateway Integration service provided by us comes with unmatched features. Try us, we guarantee you that you wont be disappointed.